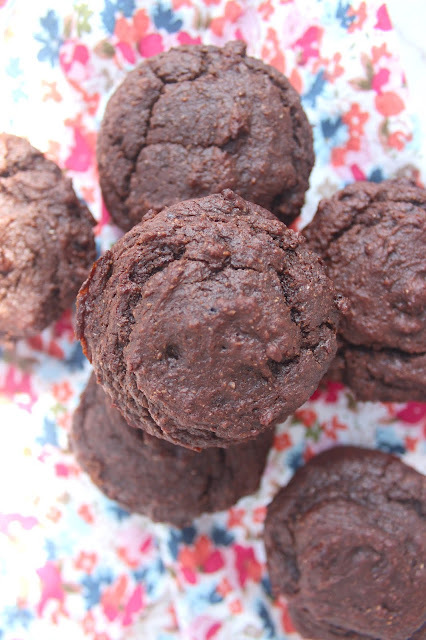 Can we still be friends if I do things like put avocado in my chocolate muffins? I know it's kinda weird, and usually I'm against this sort of thing, but when you're faced with the problem of too many ripe avocados, sometimes drastic measures have to be taken. Any regular readers know that I am obsessed with avocados. I could probably eat an avocado a day, no problem. But multiple ripe avocados in one day? That's too much even for me. Thus began my search for baked goods with avocados. I chose a chocolate muffin because, CHOCOLATE, but also because I thought the chocolate would mask the odd green avocado color. 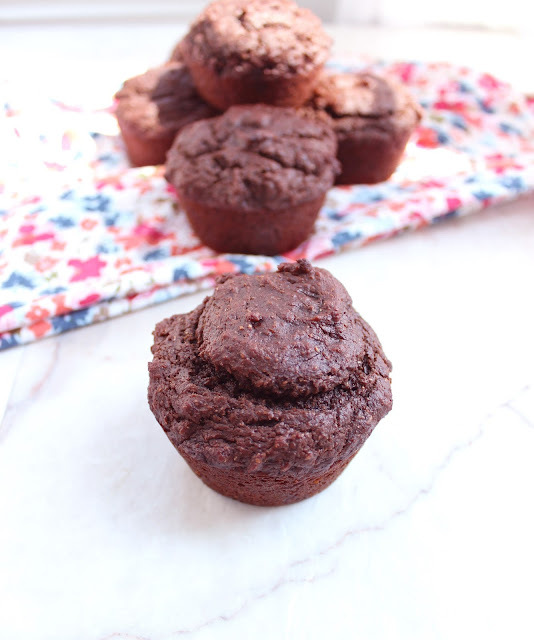 Despite my questionable feelings about non-savory uses of avocados, I love these healthy chocolate avocado muffins. 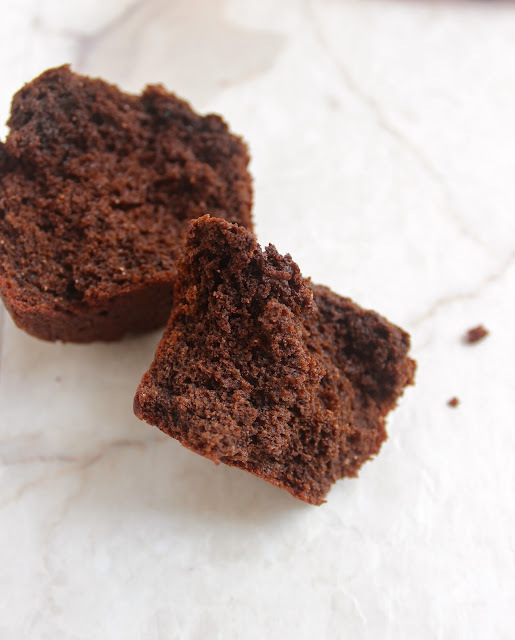 The texture is moist and immensely satisfying, thanks to the fat in the avocado and coconut oil. High-fives for chocolate muffins with vitamins and heart-healthy fats! And like the last chocolate muffins I made, I feel that these can belong in either the breakfast or dessert category. Preheat oven to 350. Line muffin tin with liners or spray with nonstick cooking spray. In a large bowl, whisk together flowers, cocoa powder, baking powder, baking soda, instant coffee granules, and salt. Pour the batter into the muffin tins and bake for 15-18 minutes or until the stops are slightly cracked and an inserted toothpick comes out clean. Recipe adapted from She Bakes Here. In two and a half years of food blogging, I have never posted a recipe with seafood. (2) I'm not confident in my cooking or preparation of seafood. (3) Adam doesn't eat it. 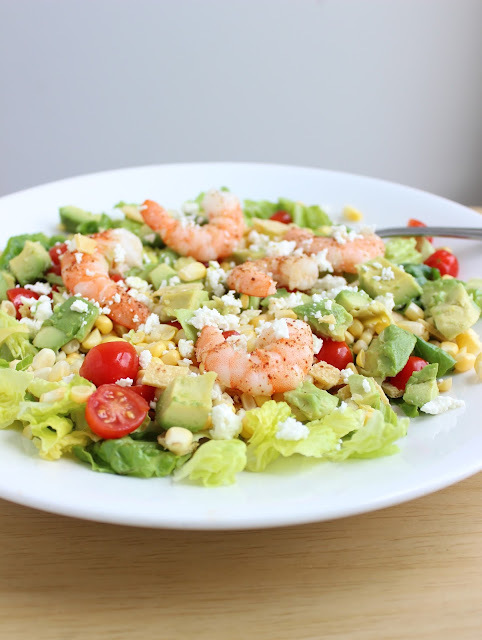 The real reason that seafood hasn't made it onto the blog before today is probably reason #3. We eat everything that I make for the blog, and I didn't want to spend time preparing an elegant seafood dish that Adam wouldn't eat. But, now that I'm living in D.C. for the summer, I no longer have an excuse not to make it for myself. One of my very favorite ways to eat seafood is in tacos. I LOVE fish tacos and shrimp tacos. They're so fresh and delicious. Bring on the extra avocado, please! The one down side to tacos is that they are messy, and anytime I make my own tacos, I fall into the inevitable trap of piling waaaaay too many ingredients inside. Basically, by the time I've eaten about three bites, my taco is falling apart. 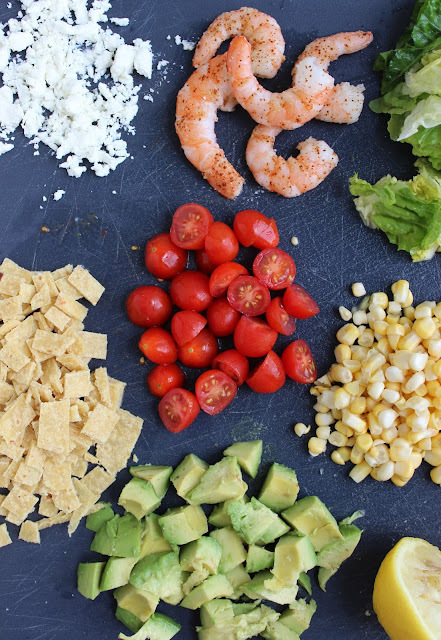 This shrimp and corn taco salad incorporates everything I love about shrimp tacos, but conveniently in salad form. 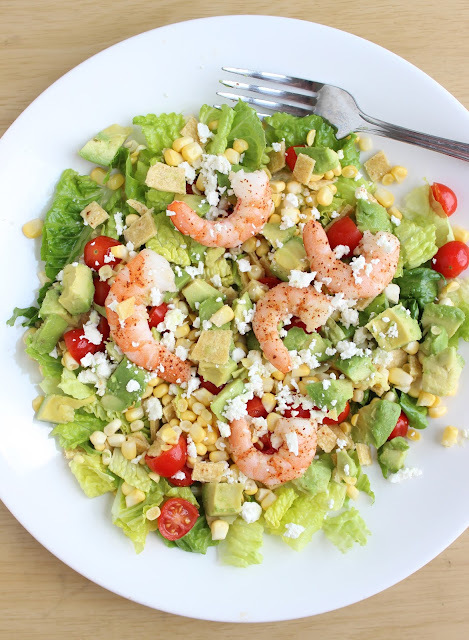 Shrimp, romaine, fresh sweet corn, tomatoes, avocado, corn tortillas, and feta cheese are combined and tossed with olive oil and lemon juice or a couple spoonfuls of your favorite salsa. Fresh, flavorful, and so filling. 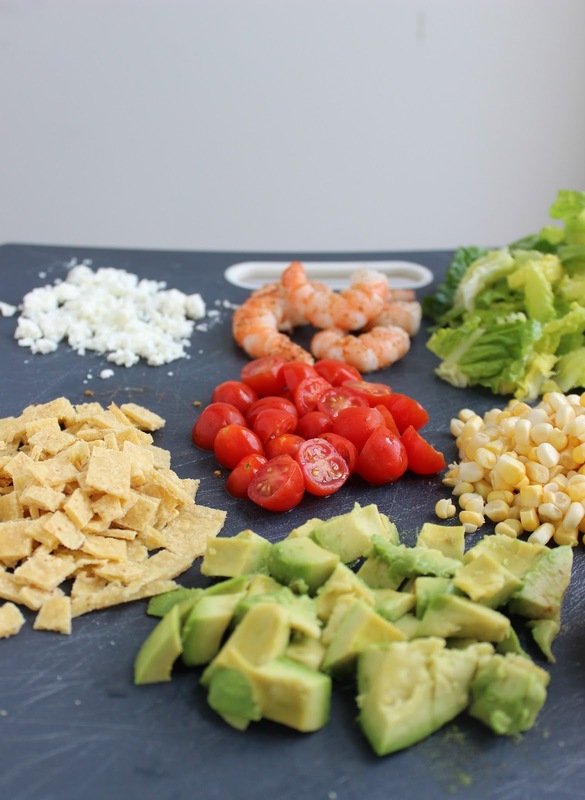 And yes, I know we have both fresh corn and corn tortillas in here, but they each provide different flavors and textures and make this salad a full-on-meal. 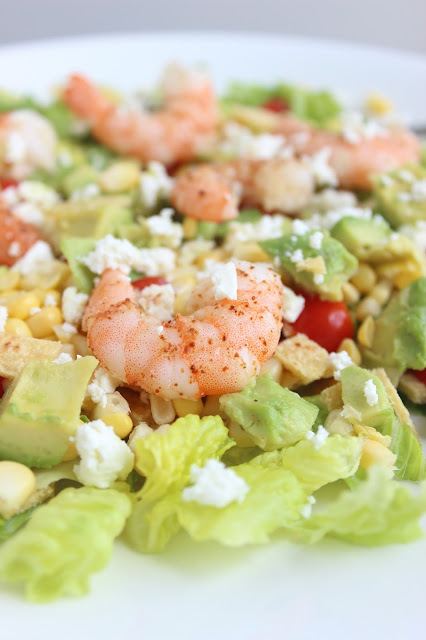 For optimal dining experience, pair this shrimp and corn taco salad with a beer and some summer sunshine! If using frozen shrimp, thaw for a few minutes in warm water. Remove tails. In a large plate or bowl, assemble the salad by combining the lettuce, tomatoes, corn kernels, corn tortilla pieces, avocado, and feta cheese. Place a medium sauce pan over high heat. Add 1-2 tablespoons of olive oil. Once oil is warm, quickly add the shrimp and sprinkle with garlic powder, chili powder and salt and pepper. Cook for 1 minute, then add the lemon juice. Cook for one minute more, or until shrimp are pink. Remove from heat. Place shrimp on salad. 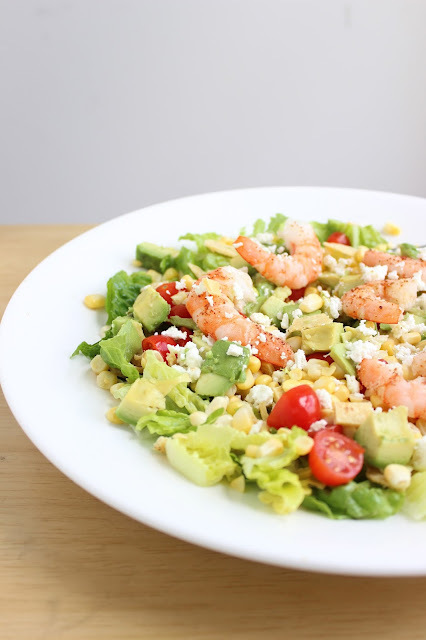 If desired, pour the olive oil and lemon juice over the salad as a dressing, and/or add a scoop of salsa. Eat up! 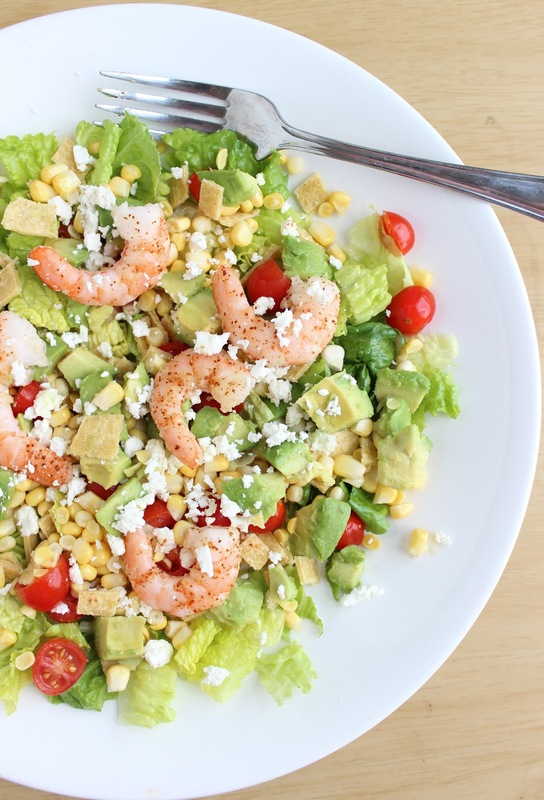 Not a fan of shrimp? Try this with shredded chicken or black beans.